Also known as Bowmac lifters or Bowmac lifting chains, panel lifters are specially designed to make the lifting of Polysafe or Bomac panels as easy as possible and minimise installation times. Safety is critical on any installation site and with Polysafe lifting equipment you have the added reassurance of knowing that the equipment will work as it should having come direct from the level crossing manufacturer. 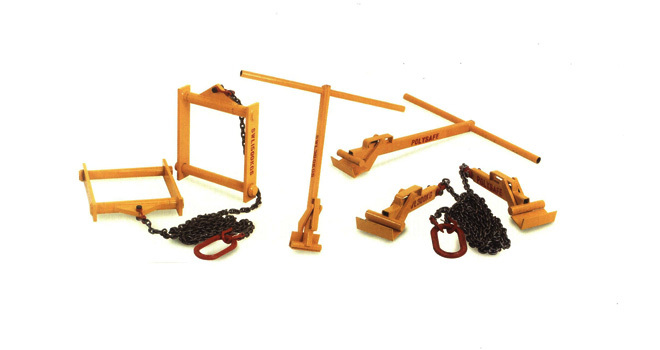 Bowmac lifting chains these attach to your chosen lifting machinery to enable mechanical lifting of the panels and are the recommended option wherever possible. Bowmac manual lifters these have handles to enable a 4 man lift of the panels and are generally used where machine access is not possible or machinery is not available. Kerb lifters are specially designed to make the lifting of Polysafe kerbs as easy as possible thereby minimising installation times. The lifters slide around the kerb unit and are secured by sliding a bar through the lifting holes in the unit itself. The chains can then be attached to your chosen machinery to enable safe lifting and positioning. All Polysafe Bowmac Lifters / Bowmac lifting chains are supplied with current test certificates an essential requirement under safety regulations. In addition, they are finished in yellow paint to denote them as lifting equipment.